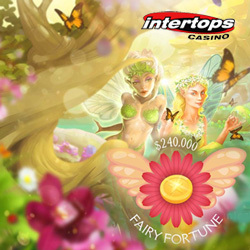 Magical forest fairies bring good luck to Intertops Casino this spring during the $240,000 Fairy Fortune casino bonus contest. Until April 29th, players will be competing with each other for $30,000 in weekly prizes. Intertops players earn points when they play slots and casino games. Every Monday 300 players with the most points get up to $500 each. The names of the top 20 weekly winners also go into a final draw for a $1000 cash prize with no wagering requirements. Intertops has hundreds of games from Realtime Gaming to choose from. During the Fairy Fortune contest three fairy-themed games -- Enchanted Garden, Enchanted Garden 2 and Stardust – will be favorites. Enchanted Garden and its sequel feature fairies and gnomes in an enchanted magical forest. In the beautiful Stardust slot, the Green Fairy is Wild and the Blue Fairy multiplies wins by 4X. Mystical Willows can trigger up to 50 free spins and the Lucky Feature can turn up to 5 reels into Wild ones. Intertops Casino has been entertaining players all over the world for more than twenty years with its huge selection of slots and table games like Blackjack and Roulette from Realtime Gaming. Players travel through time in the new Cubee, an innovative new slot game with “floating symbols”. The new Fire Dragon featuring Jackie Chan is the latest in the casino’s growing collection of Asian-themed games.